On the morning of my second day in Dubai (the only full day) I visited the Dubai museum and then the Bastakia quarter. 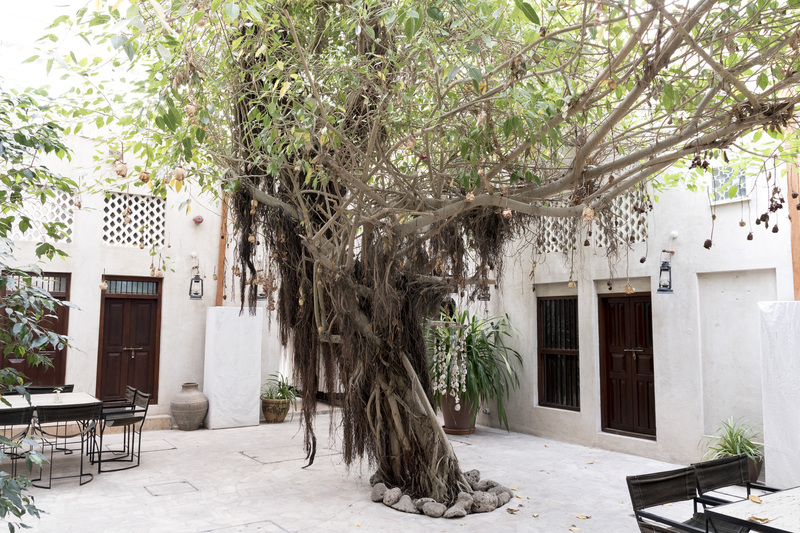 The Dubai museum is housed in the former Al Fahidi Fort, itself the oldest building remaining in Dubai. Somewhere in the museum there’s a map of ‘Old Dubai’ which shows the small town backing onto the Creek to the east with the Al Fahidi fort acting as the secure gateway to the town on the west. Now it’s buried in an inner-city area which looks ripe for re-development. Tourists inside the museum courtyard – selfies rule…. The museum, which consists of two sections, is excellent. First is the courtyard of the old fort itself, i.e. at ground level. Within that space are a number of old boats of various sizes together with a reconstructed traditional house. Possibly two houses, in fact – there’s one with thicker walls that might have been (semi) permanent and was the winter house, while an altogether lighter and flimsier structure that is described as a summer dwelling – this latter might have been temporary, erected by the inhabitants anew each summer. Secondly there are the new underground galleries. These consist of a series of life-sized dioramas showing life in Dubai as it was in the first half of the 20th century. It shows the people and the trades, crafts and activities they followed at that time. There are also interpretative displays about pearl diving – at one time Dubai was a centre of this activity – and above all there are evocative displays about the bedouin and their way of life. It’s a very good museum, and I came away with a very clear understanding of how much Dubai has changed in 60 years or so – you won’t see any pearl divers or bedouin today. In fact, that point began to niggle away at me as I was going round – the museum is a wistful evocation of how things were, with a subtext of “and this is how the real arabs lived”, yet every decision that has been made by this city’s rulers in the last 60 years or so has been to remove Dubai and its people ever further from that. In Singapore the clear message was “this is how things were – look how well we’ve done!” while in Dubai the message was almost “this is how things were – look at what we’ve lost….”. After that I went round to the nearby Bastakia quarter. This is a fairly small area of old Arab houses that’s been preserved. The houses themselves have all been repurposed, mainly into hotels or guesthouses, cafes and restaurants, and/or art galleries. It made for a very pleasant hour or strolling around. Being Arab houses they have blank exteriors – just a few very small windows facing out (and mostly on an upper floor at that). But each house is arranged around an internal courtyard, and these were delightful. Later that day I went to the mall and had my less-than-pleasant subway experience – see here – before eating in the hotel. For this second day in Dubai (and the only full day) I decided to visit the Dubai museum, to learn something about its history. After that I would wing it a bit, but I had in mind that might want to go to the Burj Khalifa area. Both of these objectives required use of the Dubai metro so the first step was to get access to that. My hotel was on the Deira (eastern) side of the creek, and the museum and other remnants of old Dubai were all on the western side, and the metro was the easiest way to get between them. The first task therefore was to get an all-day ticket for the metro. This cost 22 UAE Dirhams, or around £5, and gave me unlimited rides for the day. The metro itself was in many respects similar to the one in Singapore – very modern, and with enclosed platforms. By which I mean it’s not like (most) of the London Underground where there’s no barrier between the platform and rails; instead, as has been done in recent LU extensions, there is a ceiling-high wall between passengers and the track, but with sliding doors in it. When a train arrives its doors line up with the platform doors, both sets open simultaneously, and you step onto (or out of) the train. However, there were some differences between this metro system and any other I’ve seen. First, there’s a first class section, referred to here as the Gold car. Secondly, and more significant, there’s a complete carriage on every train reserved for women and children. On my first trip I inadvertently stepped into this carriage, realised I was the only male in it, and shuffled embarrassedly to the next carriage (the connectors are open). There were a couple of problems. First, although there were diagrams of the system on the platforms, there were no hand-out maps or diagrams available, so I had to use the street maps in my guidebook to identify the station I wanted. That introduced the second problem – several of the stations had been renamed since my guidebook was printed! So I experienced some confusion, but I managed to sort all of these out and successfully got to my morning destinations. Late in the afternoon I went to the Dubai Mall, first to have a look at what is allegedly the world’s largest shopping mall, and secondly to get to the area where the glitziest skyscrapers are, including the Burj Khalifa, the world’s tallest structure. 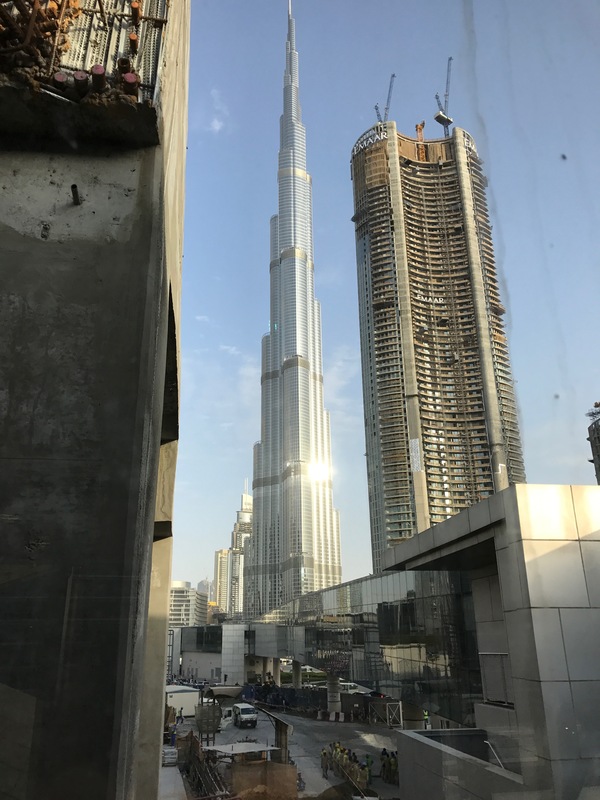 Getting there was no problem – there was a direct metro route from Union station near-enough to the hotel to a dedicated stop, Burj Khalifa/Dubai Mall. There was then a 400 metre walk along an internal walkway into the mall, and from which at a few points I was able to see the Burj. The mall itself wasn’t anything special – quite ordinary, in fact, apart from its size. However the setting of the metro Red line, on elevated tracks alongside one of the city’s main highways, and with tall skyscrapers on both sides, was quite dramatic. I was able to get some pictures of the setting. Getting back into central Dubai was a lot harder, however. I waited for a train back and when the doors opened stepped forward to get on. Then I realised that there was simply no space on the train – it was already packed full, and no-one was getting off. I gather that there are business districts further out and that using the metro is how people get back into town to their accommodation; and this was going-home time. I waited for the next train, and the next, but none were any less crowded. I noticed that each time one or two people were able to insert themselves into the carriage, so when the fourth train arrived I did the same. I then had to travel six stops to the first junction station – between the Red line which I was on, and the Green Line – where I reckoned that people might start getting off. I lost my hold on a grab handle within the first few minutes of the ride, so for the rest of that journey I was relying completely on the press of bodies to keep me upright (which it did). Eventually at the junction station a lot of people got off, and the station after that was where I was doing the same, so in the end it was OK. But it was an uncomfortable experience. Apparently this is a well-known problem for which there doesn’t seem to be a real solution on the cards. 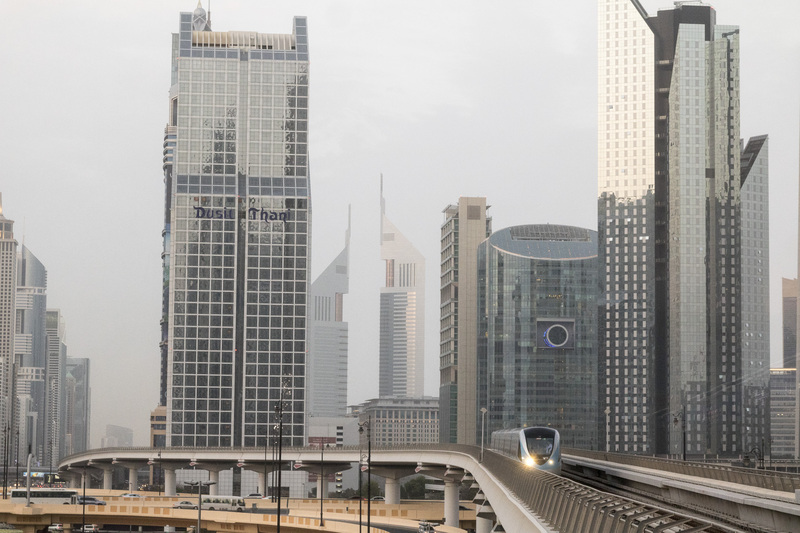 In the end I felt that the Dubai metro was useful, especially during off-peak hours; but the rush-hour crushes make it uncomfortable (the evenings are worse than the mornings). I wouldn’t want to have to do that every day, and visitors may want to bear this in mind when planning their day. I landed in Dubai at about 1 o’clock local time after seven and a half hours in the air and went though the usual immigration/security stuff. I have to say, Dubai immigration was the least efficient of the three countries that I’ve visited on this trip. And that was as a Brit – as such I could go through a fast-track procedure. Other arrivers, from India for example, had to join the back of long, slow-moving queues. It looked as if they were in for a long wait. After settling in and taking my ease for a while I went out to explore. Mainly this was to locate the nearest Dubai metro station, which turned out to be Union station, on both the Red and Green lines. It was just about 15 minutes from the hotel which meant a warm walk. However I was immediately struck by one difference between Dubai and Singapore – although the temperature figure was the same (30° or a bit over), Dubai was much drier. As the evening wore on it definitely got cooler which it never did in Singapore, so score several points for Dubai. After returning to the hotel and eating I went out again and explored the Creek. To be honest this was a bit less exciting than I had hoped – just a dock with a lot of old Arab shows moored. Interesting enough, but not especially exciting. By this time I was very tired – it was nearly 10 o’clock locally, which meant 2am by my time given that I had started the day in Singapore. So I went to bed and and slept well; until the call to prayer from the mosque next door at 5:45 or so. By this point I was wondering a bit about Dubai. But I got back to sleep and eventually rose at about 8am ready for the new day.